There are few places in the world where the effects of global warming appear to be more dramatic than the Ilulissat ice fjord. This is probably why green-tinged politicians and celebrities are routinely spotted posing for pictures close to the vast icebergs calved from the glacier at the head of the fjord. "Look," they say, "the ice is melting. Unless we dramatically cut our emissions now, the Greenland Ice Sheet and our planet are in peril." Are they right? Do scientific studies of the Greenland Ice Sheet indicate that catastrophe is around the corner? The answer does not seem to be entirely straightforward. The Ilulissat glacier has indeed retreated dramatically in recent years - more than 15km in the last decade alone - but plenty of evidence suggests such rapid change in the ice is not unprecedented. In fact, over the last 10,000 years (a period of long-term warming since the end of the last Ice Age), the glaciers on Greenland's west coast have been through many periods of advance and retreat. Four thousand years ago, the Earth was significantly warmer than it is now, and accordingly the glacier retreated; but the evidence suggests it was perhaps only 20km back from its current position. 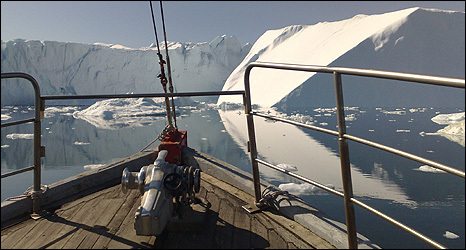 In other words, the Ilulissat glacier may reach a point in its retreat where the dynamics of the ice sheet make further regression very difficult, and very slow. 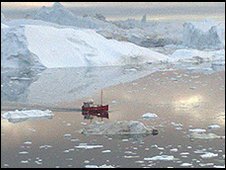 So when the more excitable climate campaigners claim that Greenland's ice sheet - which contains roughly 10% of the world's fresh water - is "melting" and that catastrophic rises in sea level can be expected within a century, it is advisable to take a deep breath and ponder the complexities of the ice. Ilulissat is a popular destination for "green-tinged politicians and celebrities"
The increased speed of flow of the Ilulissat glacier - from 7 to 14 km in a single year - means that an extraordinary mass of ice is indeed being disgorged into the sea. Glaciologists reckon as much as 35 cubic kilometres of ice each year is being shed from this one outlet alone. But there is a countervailing trend. Increased precipitation over the ice sheet, ie more snow, means at least some of the loss of mass in the ice sheet is being made good. The sea level is going to rise, but by how much in the coming century? It may even be that the ice in the middle of the Greenland sheet is becoming thicker while it is retreating at the margins. Even the experts are not entirely sure how to explain the dramatic speeding up of ice movement and melt inside the Illulisat fjord. Danish glaciologist Andreas Ahlstroem believes a significant warming of the sea is a crucial factor. But glacier movement is quickening far into the ice sheet, suggesting that increased meltwater underneath the ice is also having a major impact. Could the retreat of Greenland's glaciers be a harbinger of a much bigger change: the disappearance of the entire ice sheet? Given even the most gloomy temperature projections for the next century that is extremely unlikely. The ice in the middle of Greenland is some three kilometres thick and, deep down, it is hundreds of thousands of years old. Indeed this core ice provides an invaluable record of conditions that prevailed during the last great interglacial period, which came to an end more than 100,000 years ago. 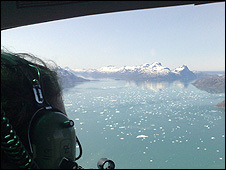 Greenland has not always been icebound. Two and a half million years ago it was covered in forest and heath, but even the worst-case scenario of man-made climate change is unlikely to reduce the northern hemisphere's greatest mass of ice to a pathetic pile of slush in the foreseeable future.